A fun aspect of writing technothrillers is seeing how close reality comes to my imagined (possible) futures. Such as with augmented-reality glasses, tech that played an important role in 2009's Small Miracles (otherwise a nanotech novel). Google goggles, aka Project Glass, were a step toward what I'd envisioned, but not quite there. Their user interface relies on spoken commands and speech recognition, and often we would wish to do our networked tasks with a bit of privacy. So I was delighted to see, much as I'd imagined it, that "Your Eyes Can Control Augmented Reality Glasses." In 2008's Fools' Experiments (largely about artificial intelligence and artificial life), I'd envisioned thought-controlled prostheses. And, indeed, we're close. As in: "Paralysed woman's thoughts control robotic arm" (that's a Brit spelling courtesy of BBC News, not a typo). The feat requires brain surgery and implanted electrodes, and so the tech isn't yet what I'd envisioned: electronics within the prosthetic device sensitive enough to interact directly with the nervous system. I'm confident that we'll get there. Taking a step away from my fiction -- but still on a personal note -- consider "The End of the Public Phone Network." I began my (first) career as an engineer at Bell Labs. Back in the 70s, the information that moved on the public network was overwhelmingly voice and analog. Now, of course, most information on the net is digital data. Voice info, too, often becomes digital data for much of its travels. The heritage, massively distributed, information system that underpins voice communications -- as amazing as it was in its heyday, and a great engineering accomplishment -- grows ever more mismatched to the task. And so, the old analog network's days are coming to an end ... perhaps as soon as 2018. While we're on the topic of doing things in new ways, here's some tech to which I'll gladly delegate. 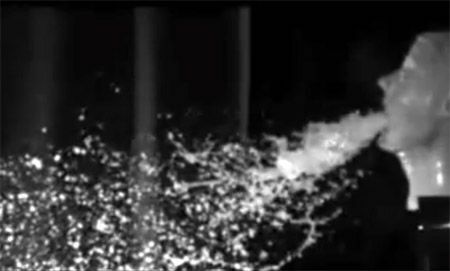 See (if you dare): "Researchers Build a Projectile Vomiting Robot."